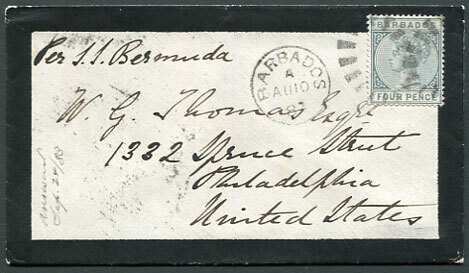 1883 mourning cover marked "Per S.S. Bermuda" to Philadelphia, USA with QV 4d grey pmk'd open bootheel duplex dated A/AU 10 87. 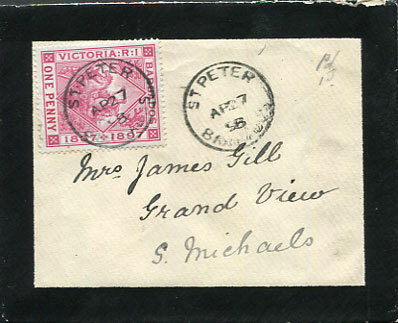 1898 mourning cover marked "Pd 1d" to Grand View, St. Michaels with 1d Diamond Jubilee pmk'd ST. PETER AP 27 98. 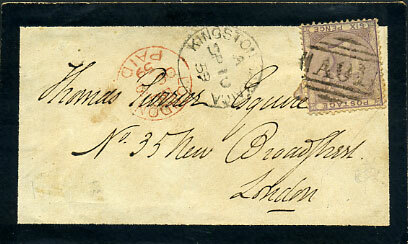 1859 mourning cover front to Thomas Perrier, London with GB QV 6d pmk'd "A01" (SG.Z5) with KINGSTON-JAMAICA A/SP 10 59 and LONDON PAID OC 3 59 cds alongside. 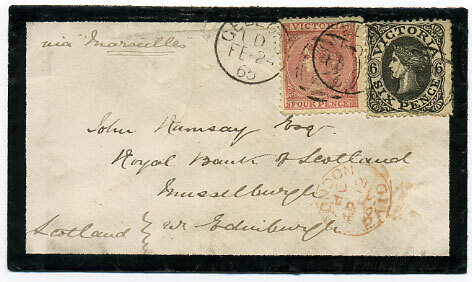 (M2-Original) seldom seen dated 5/FE 3 74 as arrival on reverse GB QV 1/- green Plate 8 mourning cover pmk'd London JA 16 74 to Scottish railway Engineer P.A. 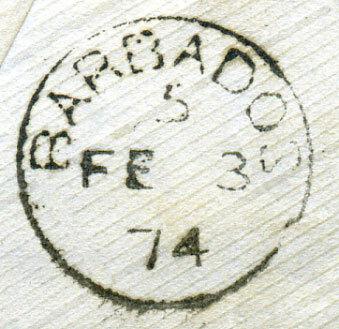 Frazer, Bridgetown re-directed to "Windy Ridge, St. John" showing I/JA 31 74 arrival I/FE 2 74 re-direction cds. 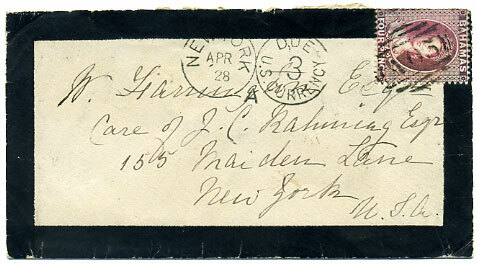 1879 mourning cover to New York with QV 4d dull rose CC wmk P.14 (SG.36) tied clear "A05" with very fine B/BAHAMAS/AP 23 79 despatch cds clear of missing flap, taxed on arrival with New York Due 3c opera-glass handstamp. 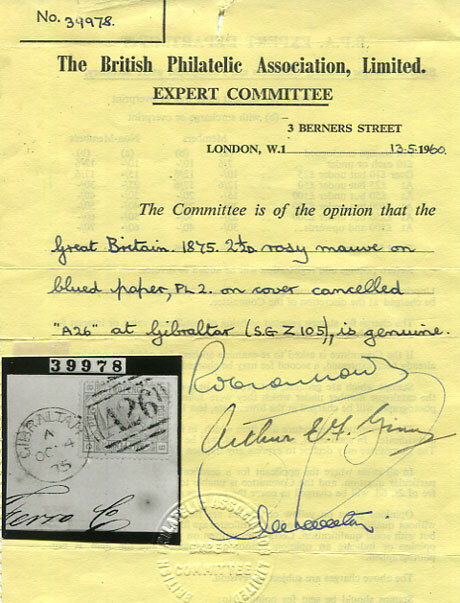 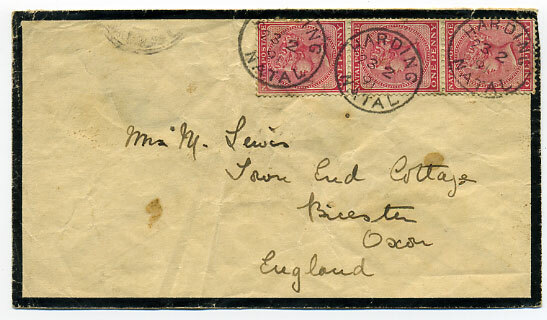 Unusually, for this period, the sender did not take the opportunity of prepaying the U.S.A. internal postage with a U.S. 3c adhesive available at the Nassau Post Office period JA 1 1879 to JY 1 1880 (date of UPU entry) and was taxed in lieu of. 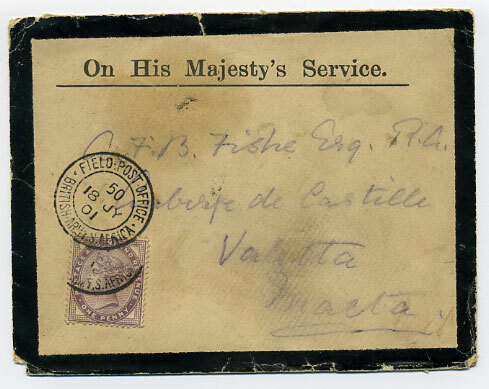 On His Majesty's Service. 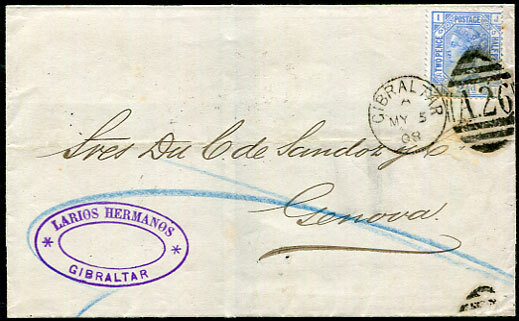 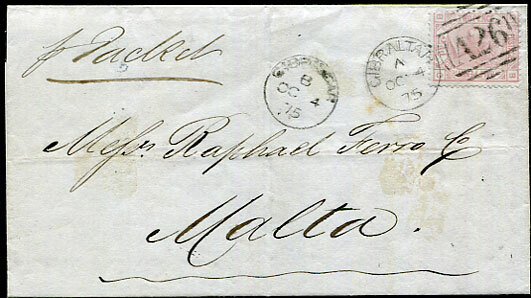 official mourning cover for the death of Queen Victoria (22 Jan 1901) with GB QV 1d lilac to Valetta, Malta, some stains/toning, b/stamped AU 14 01 arrival. 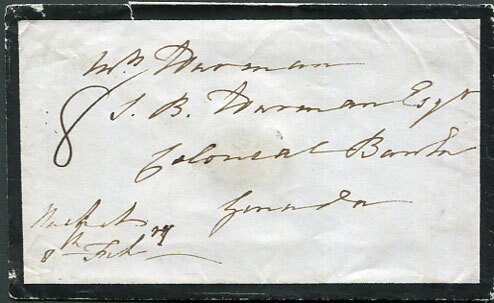 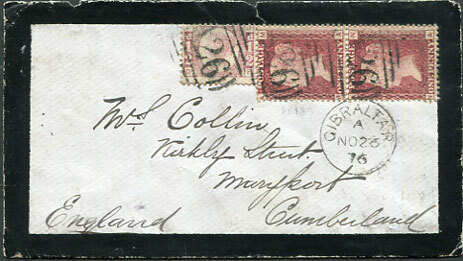 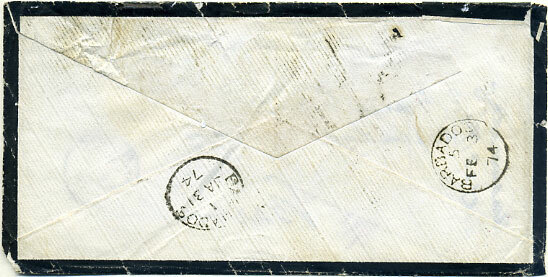 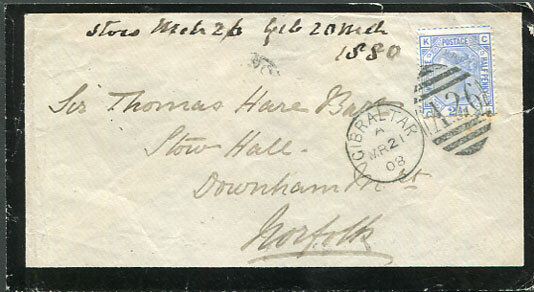 (N) on strip of three QV 1d mourning cover dated 23 2 91 to Bicester, Oxfordshire (MR 24), some creasing and blemishes. 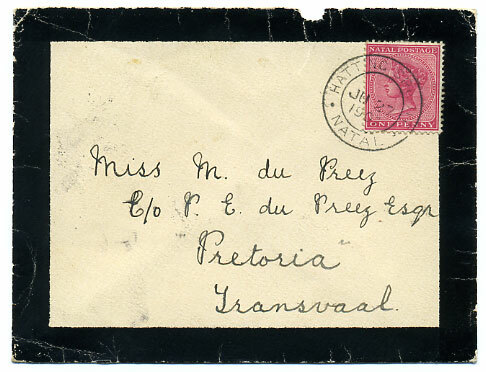 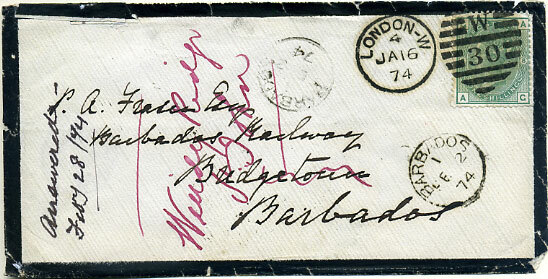 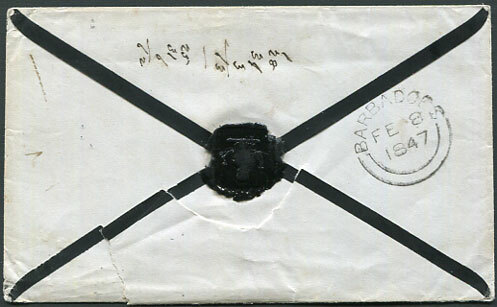 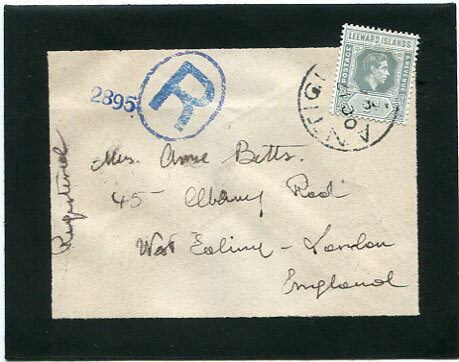 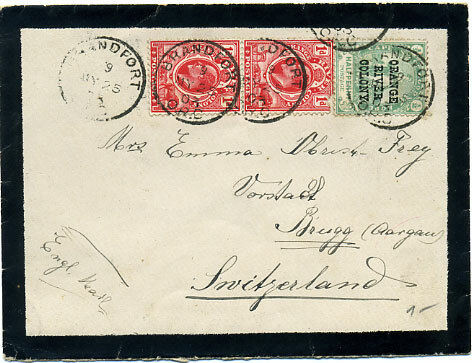 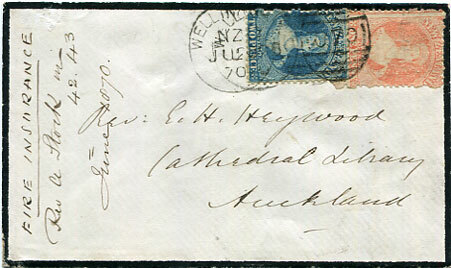 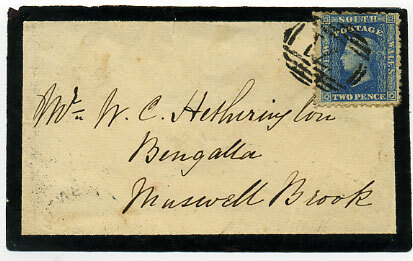 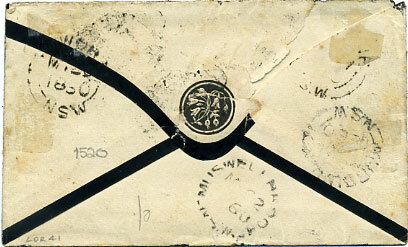 (M.2) on QV 1d mourning cover dated JU 27 1902 to Pretoria (JU 28), fault at top and 75% reverse flap removed. 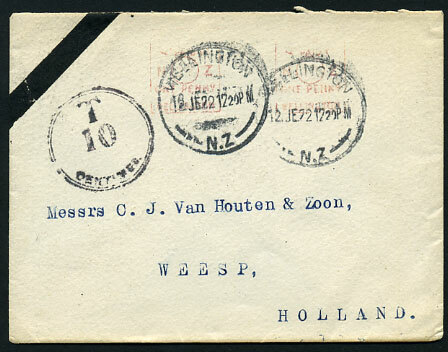 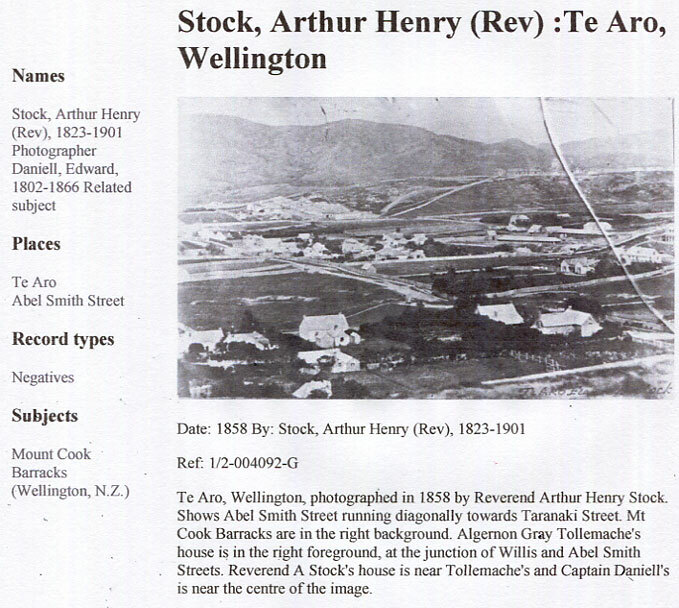 with 2 x Wellington 1d meter stamps and tax handstamp pmkd 12 JE 22.